Persia ATS Blog: Freelance recruiter — a new category of users in "Persia"
Freelance recruiter — a new category of users in "Persia"
Despite the heat of summer and the holiday season, we continue to work on improving our system. This time we want to please our customers with another useful feature. Now you can connect freelance recruiters to your account in "Persia". to create the vacancy or to work with the vacancy that is assigned to him. At the same time the information on current vacancies and work statistics of other recruiters is unavailable to freelancer. He also is not allowed to edit or delete the job which has been added by other users. 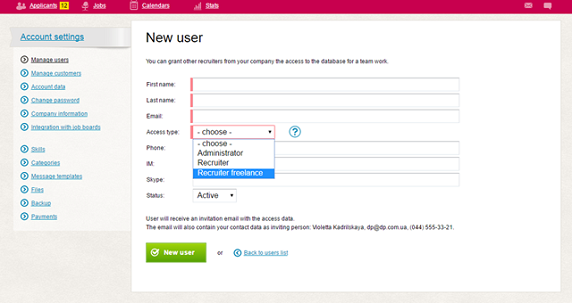 To use this feature you need to go to "User Management", click "Add User", fill in the information form about the recruiter and in the "Access Type" field select "freelance recruiter". Then again, click "Add User" and information on how to connect to the system will be sent to the recruiter’s mentioned e-mail. We are certain that the new feature will allow you to work more effectively in situations that require "extra hand" to close the position. We remind that in "Persia" there are categories of users "administrator" and "recruiter". An account administrator can add to the system both new recruiters and freelance recruiters. Besides, each team member can provide access to the information about job openings and candidates to an unlimited number of customers for whom he is picking up the staff. And we wish you generous customers, talented colleagues and productive work! Easy and beautifully written. It provides very nice and sensible resources to create and handle your personal legitimate profitable home based business. This really is an additional fantastic book by the author who really is aware of some fundamental principles about creating money. Greatest site of these are major advantages that exist for Online Businesses and buy a franchise . Simply put, these types of businesses are extremely lucrative because you don’t have to invest a lot of money; you receive lots of assistance and even a few training applications, recommended in order to all….. I have been within multilevel marketing for more than Ten years. In spite of which I think about myself a newbie. Lifestyle Design International reviews Due to all of the opportunities, I joined I never really got the training, determination, coaching I desired to be successful. Till we join Way of life Design Worldwide. LDI possesses what I have really been surfing for.